I warmly welcome you to my remodeled website. And my blog. Welcome to my re designed website! And Blog! We are still working on it…so there may be some glitches. I haven’t had much to say in my Blog for awhile. Now is the beginning of a new year, symbolic of a fresh new unwritten page. i chose this pic of myself to share because i saw two visions in it. 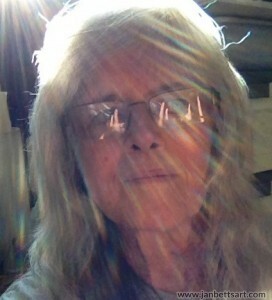 It is a selfie i was taking playing with light…. but i also see some curious figures of light reflected in my glasses, and i have no idea what they are! I took it with my Ipad, so no flashes from there. ! So these reflections represent the mystery to me… and the rainbow lights shining through me, represent my intention to take on more spiritual Light as i meet life. So that is where i am… i face the mystery, wondering what it has for me. The empty canvas. Aside from that, what my own art vision will be, is the mystery. i have learned to love the not knowing. At this stage i find the NOT knowing far more brilliant than the “knowing”. The emptiness of it allows the new to manifest more unimpeded by me.